Fiology thanks Deanna of Ms. Fiology, for shaping this lesson. First and foremost, “I wish I had spent more of my time watching TV” is said by no one … ever. Objectively, the most “optimized” way forward towards Financial Independence is to eliminate paid television altogether and redirect what would have been money spent on ridiculous cable bills to investments in a low-cost broad market index fund, reducing our timeline to FI. And of course there is the truth that if we were to eliminate television altogether, we would likely be happier and more productive. But, for the overwhelming majority of us, we will still want to view sports and our favorite shows in the comfort of our home or on our electronic devices. One of the keys to having a high savings rate is driving down monthly expenses. This requires thinking outside of the box in regards to recurring expenses including cable. 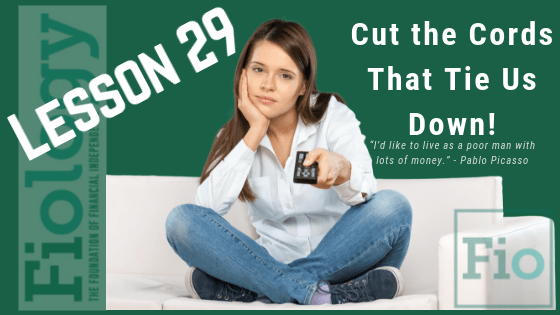 Arguably cutting the cord, in regards to cable, is a BIG way to keep more money in your pockets. There are ways to get TV entertainment for a fraction of the cost and one such option is through a one time investment of a high definition antenna. A lot of the cable companies will try to lure you into purchasing multiple services by offering a bundling discount. Don’t fall for it if all you need is internet service. Find out what speed meets your specific needs and compare the prices of local carriers. Often times you can get things like the installation fees waived for being a new customer and especially if you let the competing companies know you are receiving multiple quotes. Be sure to get any sign-up offer in writing. Take Action: For one month, commit to no television. Note how you filled your time. Did you miss your normal programming? If so, research how you can still watch the programming you missed. Your least expensive and most efficient option will likely be far cheaper than paying for a traditional cable subscription. Explore: TV Fool to determine what channels you may receive for free by using an over-the-air antenna. I get all my entertainment for free at the local public library. Free books, free movies, free TV shows. Having bought a small one bedroom condo for cash eleven years ago, my housing expense is $300 per month. So I guess I have fulfilled Picasso’s dream — living like a poor person with plenty of money. Seems like you have it all figured out! Would love to hear more of the story. Not many people were thinking so strictly about Financial Independence eleven years ago.